Looks like the Story of Star Wars plays on Earth too in the next Episode. I took these pictures on my Flight back from the States to Germany at the Frankfurt Airport. 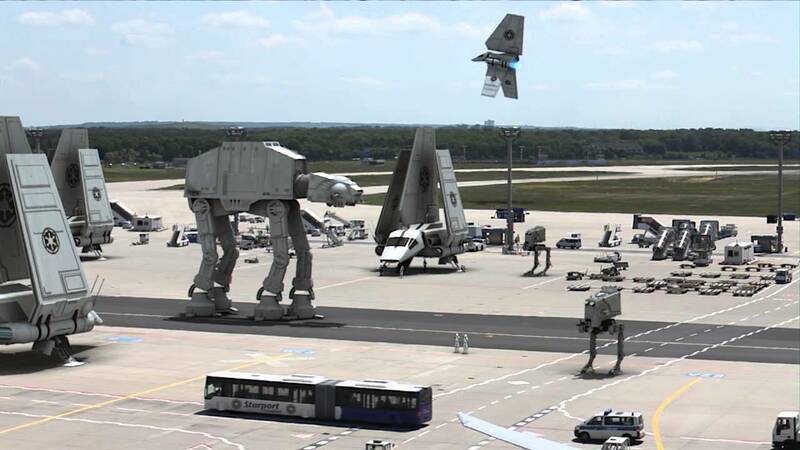 Seems like the biggest german airport plays a key role as an imperial starport in the new episode — there have just been imperial forces at the scene. Star Wars Episode VII is an upcoming American epic space opera film, produced by Walt Disney Pictures, Lucasfilm, and Bad Robot Productions, and distributed by Walt Disney Studios Motion Pictures. It is intended to be the seventh installment in the Star Wars film series. The film stars John Boyega, Daisy Ridley, Adam Driver, Oscar Isaac, Andy Serkis, Domhnall Gleeson, Max von Sydow, Lupita Nyong’o, and Gwendoline Christie, with Harrison Ford, Carrie Fisher, Mark Hamill, Anthony Daniels, Peter Mayhew and Kenny Baker reprising their roles from previous films. It is planned to be the first of the third trilogy of Star Wars films, following chronologically in the series approximately 30 years after Return of the Jedi. J. J. Abrams is directing the film from a screenplay he co-wrote with Lawrence Kasdan, who acted as co-writer on The Empire Strikes Back and Return of the Jedi. They replaced Michael Arndt, who left the project after initially being attached to pen the screenplay and previously writing the story treatment.